Langila (New Britain, Papua New Guinea): Volcanic Ash Advisory Center Darwin (VAAC) issued the following report: MINOR VA EMISSIONS TO FL080. Sinabung (Sumatra, Indonesia): Volcanic Ash Advisory Center Darwin (VAAC) issued the following report: CVGHM REPORT ERUPTION TO FL160 AT 21/0844Z. Bogoslof (United States, Aleutian Islands): An eruption occurred at the volcano early this morning (at 01 am UTC). A brief, but relatively strong explosion seems to have produced a short-lived ash plume which was spotted on satellite data and by pilots en route in the area. Volcanic Ash Advisory Center Anchorage (VAAC) issued the following report: ERUPTION TIME EST 0100Z. 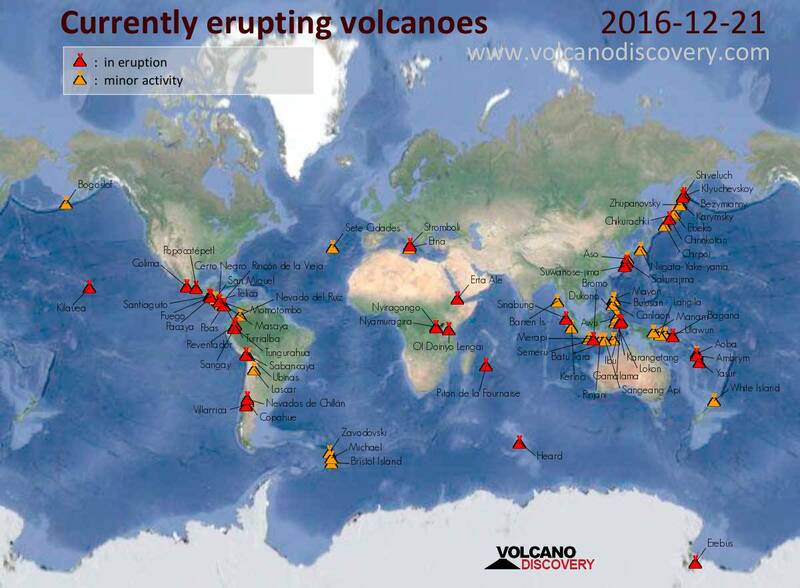 ERUPTION DOES NOT APPEAR TO BE CONTINUOUS AND VA REPORTED AS DSIPT. Colima (Western Mexico): Explosions continue to be frequent at the volcano (intervals of 1-2 hours average). At the same time, the lava flow on the southern slope remains weakly active. In other words, activity has been relatively stable during the past weeks. Fuego (Guatemala): (21 Dec) Volcanic Ash Advisory Center Washington (VAAC) issued the following report: RPRTS OF VA EM.